It has been my pleasure to be the American Correspondent for FLOORS in Africa Magazine since February 2000. 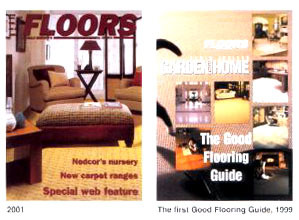 FLOORS is published every 6 weeks by Iphansi Publications (Pty) Ltd. in South Africa. 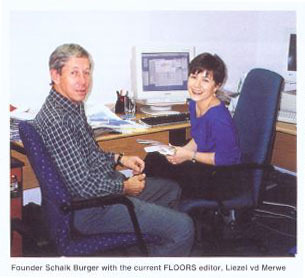 The founder of FLOORS in Africa, Schalk Burger, has been active in many of his country's flooring industry associations dating back to 1969. Since 1983, he and his team have built FLOORS into an internationally recognized magazine that has become a comprehensive resource for flooring industry information in South Africa. Schalk's dedication and determination to contribute to the betterment of our trade at all levels has been demonstrated time and time again to those who have worked with him over the years. Special thanks to FLOORS editor Liezel van der Merwe for permission to reprint Schalk Burger's article celebrating FLOORS in Africa's 150th issue (Vol. 20, No. 1, 2002, p. 76). On behalf of Schalk and Liezel, "Groete uit Suid-Afrika (Greetings from South Africa)!" Back in 1983, the decision to launch a magazine for the South African flooring industry was more brave than financially wise. the flooring industry in South Africa had never had a dedicated flooring magazine before and having been secretary to flooring associations since 1969, I thought I had enough contacts to make it work. But as with all great ideas - the hard part was putting it on the ground. There were about 20 potential advertisers, with the emphasis on potential as we ended up with an average of eight per edition during the first year and only five for the first edition. What pulled us through was the Nouwens Carpets advertising campaign. The carpet doyen Kees Nouwens bought all the front covers, inside front cover, outside back cover and the middle page spread! For two years! At a discount of course!! Only problem was, the industry later called it the Nouwens Carpet Magazine as there were so little other advertising in the magazine. Romatex, several years later, a high profile campaign from them saw us through some nasty doldrums. In similar vein were periodic intensive campaigns by Belgotex Carpets which kept us afloat especially during recessionary times. In years to follow, several such boycott actions from various quarters had me sweating blood but somehow we survived it all. Even the major economic slump of the late 80's and several other mini recessions still saw FLOORS emerge - battered and bruised but surviving. Then of course there was Ian Hughes of FAS who always competed keenly. He was forever blowing in my neck, taking business away! Thanks Ian, you kept me on my toes. Three other people who kept me on my toes and taught me never to comprise on quality were John Maxwell of Marley, Luci Nouwens and Daniel Dolpire. John used to comb through the publication with a red ballpoint pen for proof-reading mistakes while Luci and Daniel simply refused anything but top reproduction quality. Thanks - I often hated you all but I never stopped appreciating your input. The quality of FLOORS today is very much your compliment as well. for believing in me when I was confronted with crucial choices. I know I left out names - the more grey my hair, the less the grey matter up top. Without the support of the industry, advertisers and our loyal readers in the specifying fraternity, this 150th edition of FLOORS in Africa would never have happened. A special thank you to Wessels Smuts of Business Print Centre, our printers, who gave me credit at a time when I was on my knees. To the FLOORS staff through the years - whatever your contribution - thank you. A special thanks to Fanie Venter who brought financial dissipline when it was needed most. It is an ungrateful job but he did it with great distinction. And then Liezel - everyone knows how proud I am of her. She made a winner out of FLOORS in Africa. She was the main driving force for getting onboard ceramics, wood and laminates. I am humbled by my blessings from Above! Copyright 2002 FLOORS in AFRICA. All rights reserved. Permission to reprint courtesy of Liezel van der Merwe, Editor of Floors in Africa magazine. Web page created by Dave Spreen's Flooring Resources.